If you're like me, and all your friends are getting married and becoming pregnant (or vise versa), then you are sick and tired of getting minute by minute updates on Junior's bowel movements and being on the receiving end of quizzical looks when you politely explain that bringing up your own little Satan just doesn't interest you. So far I can only find Itsy Bitsy Spider and Where is Thumkin?, but I'm sure someone has a bootleg somewhere. 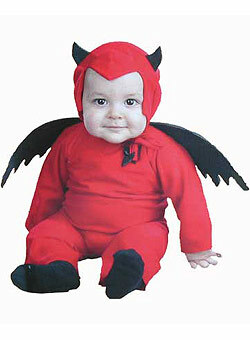 Ah, but where can I buy that adorable Spawn of Satan suit for my nephew?